Shiratori castle (白鳥城) is a mountain castle built before 12th century. It appears first time in 1183 by record of Imai Kanehira. During the Sengoku period, Jinbo extended this castle against Uesugi Kenshin. Later, it became the brunch castle of Toyama Castle. When Hideyoshi attacked Sassa, Oda Nobukatsu used this castle. Today, it has great view of Toyama area. 1. use Takayama Line to Nishi Toyama. Built in: Before 12th century. It is located on the top of Mt. Shiroyama which is 145m high. Its baileys, wells and dry moats still remain. Because this castle east side of this mountain has hard cliff, it is very strong for east side where Toyama Castle is located. However, west side of this castle has only easy slope, so it was very weak by attacking from west side. This castle was built in very early time. 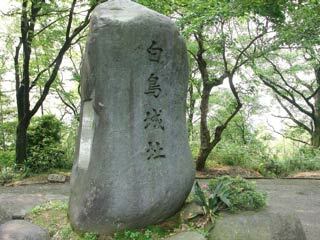 It appears in the record of Minamoto no Yoshinaka. Yoshinaka's general Imai Kanehira settled his headquarter at this castle. After Sassa Narimasa was defeated, Maeda Toshiie ruled this castle. Current structures of this castle were built by Toshiie.